"JOHNSON'S ROTARY". 2.477" high x 1.098" wide x .909" deep. Brass case. Brass shackle. 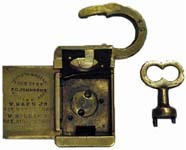 A glass seal lock. Mfg by: Johnson's Rotary Lock Co. Frank G. Johnson Patent # 31320, Wilson Bohannan and Frank G. Johnson Patent # 55048, Ward McLean Patent # 57539. "JOHNSON'S ROTARY". 2 5/16" high x 1 1/2" wide x 11/16" deep. Brass case. Brass shackle. "No 66" is stamped on the obverse of the shackle. Mfg by: Johnson's Rotary Lock Co. Frank G. Johnson Patent # 31320. "JOHNSON'S ROTARY". 2 13/16" high excluding clevis x 3 5/16" high including clevis x 1 15/16" wide x 3/4" deep excluding dust guard and back panel. Brass case. Brass shackle. Spring dust guard. Mfg by: Johnson's Rotary Lock Co. Frank G. Johnson Patent # 31320. "JOHNSON'S ROTARY". 3 1/4" high x 2 1/2" wide x 1" deep. Brass case. Brass shackle. 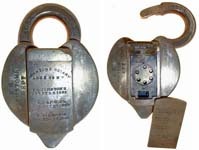 Mfg by: Johnson's Rotary Lock Co. Frank G. Johnson Patent # 31320, Wilson Bohannan and Frank G. Johnson Patent # 55048. "JOHNSON'S ROTARY". 3 7/8" high excluding clevis x 3" wide x 1 3/16" deep including dust guard. 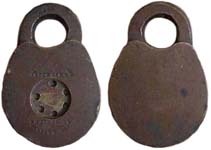 Mfg by: Johnson's Rotary Lock Co. Frank G. Johnson Patent # 31320, Wilson Bohannan and Frank G. Johnson Patent # 55048. "JOHNSON'S ROTARY". 4" high x 3 1/16" wide x 1 1/8" deep including dust guard and raised panel on the back of the lock. Brass case. Brass shackle. Mfg by: Johnson's Rotary Lock Co. Frank G. Johnson Patent # 31320. "U. S. CUSTOMS DEPT" - "GTRR". 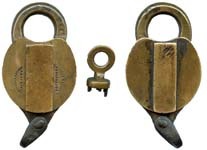 3.27" high excluding clevis x 3.8" high including clevis x 2.42" wide. Brass case. Brass shackle. 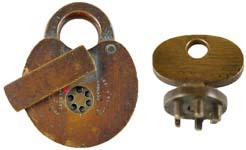 A seal lock. Made for: United States Customs. 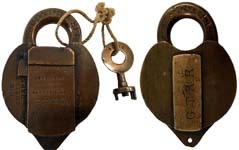 Used on the Grand Trunk Railroad. 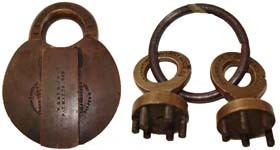 Mfg by: Johnson's Rotary Lock Co. Frank G. Johnson Patent # 31320, Wilson Bohannan and Frank G. Johnson Patent # 55048, Ward McLean Patent # 57539. "U S MAIL". Brass case. Brass shackle. Made for: United States Postal Service.